Some teens lead healthy, productive, positive lives. Others are troubled, self-destructive, and negative about themselves and the future. What makes the difference? The presence of specific assets in their lives—not financial assets, but Developmental Assets™ including family support, self-esteem, a caring school climate, adult role models, structured time, and positive peer influence. It's a proven fact: The more Developmental Assets™ a young person has, the less likely he or she is to engage in at-risk behaviors. Our best-selling book What Kids Need to Succeed tells parents, teachers, and community leaders how to build assets in young people. 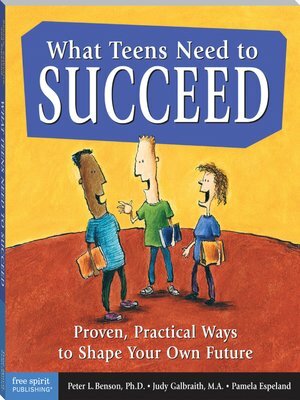 Now What Teens Need to Succeed inspires and empowers teens to build their own assets. It invites readers to identify the assets they already have and the ones they need, clearly describes the 40 assets identified as most essential, then gives hundreds of suggestions teens can use to develop the assets at home, at school, in the community, in the congregation, with friends, and with youth organizations. "Assets in Action" sections show how people across the nation are creating healthy communities using the asset-building model. Resources point the way toward additional books, organizations, and Web sites.